Bell Labs Created Our Digital World. What They Teach Us about Innovation. What do these following crucial, society-altering innovations have in common? I don’t know about you, but really, I had no sense of the impact Bell Labs had on our current society. Gertner writes a compelling narrative intermingling the distinctive personalities of the innovators with layman points of view about the concepts they developed. In doing so, he brings alive an incredible institution that was accessible only as old black-and-white photos of men wearing ties around lab equipment. For the history alone, read this book. You will gain knowledge about how the products that define life today came into being back in the 1940’s, 50’s and 60’s. I say that as someone who really wasn’t “in” to learning about these things. Gertner, a writer for Wired and the New York Times, invites you into the world of these fascinating, brilliant people and the challenges they overcame in developing some damn amazing technological achievements. Those stories really carry the book. But just as interesting for innovation geeks are the lessons imparted from their hands-on work. There are several principles that created the conditions for innovation. Sure, the steady cash flow from the phone service monopoly AT&T held for several decades was a vital element. But that alone was not sufficient to drive innovation. How many companies with a strong, stable cash flow have frittered away that advantage? Looking beyond the obvious advantage, several elements are seen which determined the Labs’ success. They are described in detail below. In an interview with a Bell Labs engineer, Gertner got this wonderful observation. Bell Labs inhabited “a problem-rich environment”. Bell Labs’ problems were the build-out of the nation’s communications infrastructure. How do you maintain signal fidelity over long distances? How will people communicate the number they want? How can vacuum tube reliability be improved for signal transmission? How to maximize spectrum for mobile communications? I really like this observation, because it sounds obvious, but really isn’t. Apply efforts to solving problems related to the market you serve. It’s something a company like 3M has successfully done for decades. Where you see companies get this wrong is they stray from the philosophy of solving customer needs, becoming internally focused in their “problems”. For instance, what problem did New Coke solve for customers? And really, what problems is Google+ solving for people that aren’t handled by Facebook and Twitter? A problem of, “our company needs to increase revenues, market share, profits, etc.” isn’t one that customers give a damn about. Your problem-rich environment should focus on the jobs-to-be-done of customers. The labs were deliberately stocked with scientists from different disciplines. The intention was to bring together people with different persepctives and knowledges to innovate on the problems they wanted solved. For example, in developing the solid state transistor, Labs researchers were stumped to break through something called the “surface states barrier”. Physicist Walter Brattain worked with electrochemist Robert Gibney to discover a way to do so. Two separate fields working together to solve a critical issue in the development of semiconductors. The value of cognitive diversity was systematically modeled by professor Scott Page. Bell Labs shows its value in practice. Ever seen some of these famously wrong predictions? Now, before we get too smug here…haven’t you personally been off on predictions before? I know I have. The point here is not to assume fundamental deficiencies of character and intellect. Rather, to point out that they will occur. What makes wrong predictions more harmful is the position of the person who makes them. Experts are granted greater license to determine the feasibility and value of an idea. HiPPOs (high paid person’s opinion) are granted similar vaunted positions. In both cases, their positions when they get it wrong can undermione innovation. Bell Labs was not immune. Two examples demonstrate this. One did not derail innovation, one did. In the late 1950s, Bell Labs engineers considered the idea that mobile phones would one day be small and portable to be utopian. Most considered mobile phones as necessarily bulky and limited to cars, due to the power required to transmit signals from the phone to a nearby antenna. In this case, the engineers’ expertise on wireless communications was proved wrong. And AT&T became an active participant in the mobile market. In the late 1950s, Bell Labs faced a fork in the road for developing transistors. The Labs had pioneered the development of the transistor. Over time, the need for ever smaller transistors was seen as a critical element to their commercialization. Bell Labs vice president of device development, Jack Morton, had a specific view on how transistor miniaturization should happen. He believed a reduction in components was the one right way. Even as development of his preferred methodology was proving technically difficult, he was unwilling to hear alternative ideas for addressing the need. Meanwhile, engineers at Texas Instruments and Fairchild Semiconductor, simultaneously and independently, developed a different methodology for miniaturization, one that involved constructing all components within one piece of silicon. Their approach was superior, and both companies went on to success in semiconductors. Bell Labs, pioneers in transistors, lost its technological lead and did not become a major player in the semiconductor industry. With mobile phones, the experts could not see how sufficient power could be generated. Fortunately, their view did not derail AT&T’s progress in the mobile market. In the case of semiconductors, Bell Labs engineers were aware of the integrated circuit concept, before Texas Instruments and Fairchild introduced it. But the HiPPO, Jack Morton, held the view that such an approach could never be reliable. HiPPO killed innovation. When you think you’ve got a big, disruptive idea, what’s the best way to handle it? Go big or go home? Sure, if you’re the type to put the whole bundle on ’19’ at the roulette table. Otherwise, take a cue from how Bell Labs handled the development of the first communications satellite. Sputnik had been launched a few years earlier, and the satellite race was on. The basics of what a satellite had to do? Take a signal from Location A and relay it Location B. Turns out, there were a couple models for how to do this: ‘passive’ and ‘active’ satellites. Passive satellites could do one thing. Intercept a signal from Location A and reflect down to Location B. In so doing, they scattered the signal into millions of little bits, requiring high-powered receptors on the ground. Active satellites were much more equipped. They could take a signal, amplify it and direct it to different places it had to get to. This focused approach required much lower-powered receiving apparatus on the ground, a clear advantage. This is generally going to be true. Even patented innovations will find substitute methodologies emerging to compete. Which fits a common meme, that ideas are worthless, execution is everything. It’s also seen in the dynamic of the first-to-market firm losing the market by subsequent entrants. After the innovation, relentless execution is the key to winning the market. Wrapping this up, I recommend The Idea Factory. It delivers an excellent history of an institution, and its quirky personalities, that literally has defined our digital age. No, they didn’t invent the Internet. 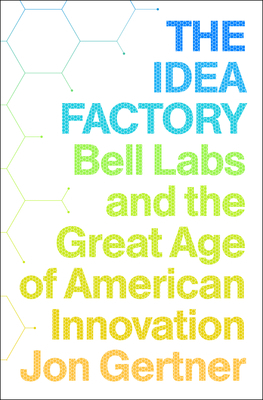 But all the pieces that have led to our ability to utilize the Internet can be traced to Bell Labs. Innovation students will also enjoy the processes and approaches taken to achieve all that Bell Labs does. Jon Gertner’s book is a good read.